President Obama can do little other than teach, in the last year of his presidency and with a majority opposition. Obama just advised the British to vote for the EU on the Brexit referendum. He is at risk of infringing upon national sovereignty, the very thing that the referendum is about. Leaving the EU still allows various alternatives. If the vote would split over those options, perhaps one better stays. There is no way of knowing. Referenda tend to be silly and dangerous. Referenda work only well when there are two options only, with a clear-cut Yes / No answer. This kind of question occurs only by exception. Normal issues have more options and grades of grey. With at least three options, there arises the Condorcet paradox. For such issues, there better be representative government, with a Parliament selected by proportional representation (PR), and which Parliaments uses more complex methods for bargaining and voting – see Voting Theory for Democracy. The pitfall is that a question might seem to have a clear-cut Yes / No answer while it actually has other options and such grades. Check how the Brexit question masks the other options. It often is an issue of political manipulation to reduce a complex issue to seeming simplicity, and to create a situation such that the political leader who drafts the question might argue to have the backing of the people. Referenda belong to populism and not to democracy. In this case, UK prime minister David Cameron has to overcome a rebellion in his own party and the threat of defection to UKIP. Check this report on Cameron’s bargaining with the EU. Given this bargaining result Cameron now argues for the EU and he hopes to secure peace in his party. It is somewhat curious that the whole of the UK is called to the ballot box to resolve such internal strife, but the same happened in 1975 with Harold Wilson and the Labour Party. Churchill argued for a united Europe. Margaret Thatcher started out as a European, supported Europe in 1975, actually initiated and signed the 1986 Single European Act, with the change from a Common Market (with veto power by country) to the (Europe 1992) Single Market (replacing veto power by qualified majority), and whisked it through the UK Parliament without proper discussion about this abolition of national sovereignty. Only later came the 1988 Bruges speech. There is no recognition for Bernard Connolly whose The Rotten Heart of Europe helped the British to stay out of the euro and to keep the pound. There is still room for a better approach to the notion of an optimal currency area. There is little clarity about what the economic discussion really has been about. “Economic union” and “political union” are vague words, and it seems relatively easy to make a political speech or TV broadcast with these. Details matter however. Details help to keep out the ideologues. It is said that Britain has the best economists (Marshall, Keynes, Hicks) but Germany the best economy. Margaret Thatcher would have been much more effective when she had proposed good economics rather than banging the handbag. The relation of the UK to the EU would have been far better had the UK shown better economic analysis and an economy to prove it. Thatcher came to power during a time of stagflation when economists were in disarray and neoliberalism seemed the only way out. This neoliberalism however contributed to the global financial crisis and the economic crisis of 2007+. See my analysis since 1990. Of the core issue, a recent turn is the myth about German decentralised labour market bargaining. Britain has an impact on the European economy via the City and its banks (a fair reason to stay in), but why doesn’t Britain have more impact ? Democracy in the UK suffers from district representation (DR), and it would be better to have proportional representation (PR). There is too little awareness in the UK that much of their political mayhem is caused by their rather unresponsive electoral system. See the comparison of Holland and the UK, and see how Nick Clegg shot his own foot (and destroyed the LibDems). PM. After writing this, I discovered this review of “Europe: Them or Us” by Sean O’Grady and he says much of the same thing. The recent Dutch referendum on the Association treaty with the Ukraine is another example of how referenda can be silly and dangerous. I voted against that treaty because of the military section hat would involve the EU in helping secure the Ukrainian borders, which would effectively move NATO’s borders eastward. Government propaganda did not pay much attention to the military section and emphasized the section on free trade. Even there the propaganda didn’t draw the parallel with the economic collapse in East Germany (DDR) when it was merged with West Germany (BRD). In this case, representative democracy failed, for it created this Association treaty, and the Dutch referendum was a freak event that might actually do some good. It still confirms that referenda tend to be silly and dangerous, since the proper answer would have been a better informed discussion in Parliament, notably by having (a) an Economic Supreme Court, (b) annual elections. Roefie Hueting (1929) is an economist and jazz piano player, or a jazz piano player and an economist, who cannot decide which of the two is most important to him. See this earlier report on his double talent. Hueting’s first public performance was on stage on liberation day May 5 1945 at the end of World War 2, when he was dragged out of his home to play for the people dancing in the streets. He still performs and thus he has been 55+15=70 years on stage. With the Down Town Jazzband (DTJB) Hueting recorded 250 songs, played on all major Dutch stages, five times at the North Sea Jazzfestival, while the 50th DTJB anniversity of 1999 was together with the Residence Orchestra in a sold-out The Hague Philips Hall. Hueting was one of the founders of the Dutch Jazzclub from which sprouted The Hague Jazz Club. This HJC has its current performances at the Crowne Plaza Hotel, formerly known as the “Promenade”. This hotel is at the Scheveningseweg, the first modern road in Holland, created by Constantijn Huygens in 1653, connecting the area of the Peace Palace – the area where also Grand Duchess Anna Paulowna of Russia (1795-1865) had her Summer palace – to the sea. See also these pictures of the German Atlantik Wall – to stay with the WW 2 theme. At the celebration last Sunday September 27 other performers were Joy Misa (youtube), Machteld Cambridge, Erik Doelman (youtube) and Enno Spaanderman. 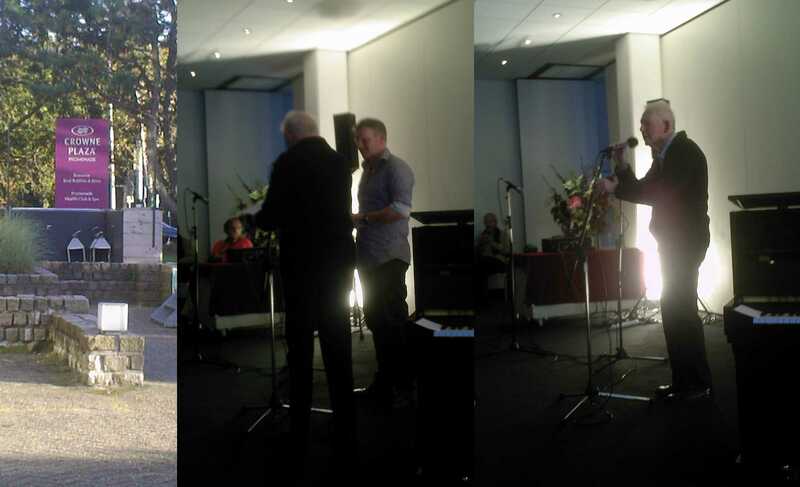 The Hague Alderman Joris Wijsmuller (urban development, housing, sustainability and culture) came to present Roefie Hueting with a book containing a picture of Mondriaan‘s Victory Boogie-Woogie – also celebrating the end of WW 2. Wijsmuller observed the erosion of “sustainability” that in the opinion of Hueting rather should be “environmental sustainability”. Last weblog referred to Pseudo Erasmus who referred to Graig Willy who referred to Thierry Medynski who referred to Emmanuel Todd. Medynski uses a colour scheme for Todd’s categories that I find hard to remember. It also appears that Willy has given a colour to Russia while this is not available from Medynski. 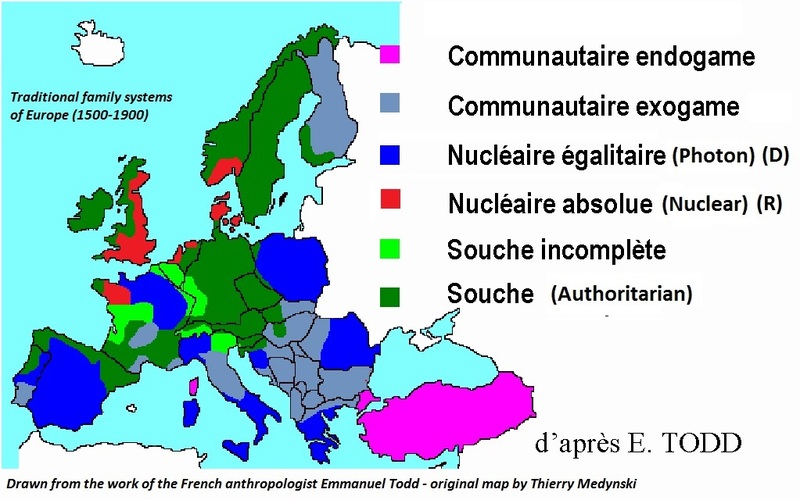 Thus, let me return to Medynski’s map and propose a colour coding that seems easier to remember (updated May 18). My suggstion is: Green will be the authoritarian stem family structure that can live with inequality. Gray blue will be the authoritarian family structure that wishes to see equality except for the patriarch. Red allows for inequality but because of liberal tendencies. Blue combines liberalism and equality. The blue-ish area identifies the region in which equality dominates. This gives the following map – in which the legend is also sorted from blue to red. There is more cohesion between Germany and Norway and Sweden than commonly perceived. My suggestion is based upon the USA Red and Blue, for the Republican versus Democratic states. The differences between red and blue states may not be quite comparable to Todd’s scheme, but it helps to develop the idea and identification. Still, the clue is that the USA apparently has been shaped predominantly because of the nuclear family structure. The differences between Republicans and Democrats thus may be linked to the differences between England and the Ile de France. Check out Todd’s 2013 Harper’s video on the euro – with thanks to Pseudo Erasmus for alerting us to this. See also Jamie Galbraith and perhaps also not so strong John Gray. And then see my paper Money as gold versus money as water. PM 1. For completeness and comparison, this is the colour scheme of Medynski’s image. We changed only red and yellow but it still makes a difference in reading. PM 2. Never forget about the Heineken Eurotopia map. PM 3. Check whether there is a relation with the other French intellectual, Thomas Piketty. PM 4. Russia would have the gray blue too, which confirms Willy’s adaptation of Medynski’s image.